We've all been there. You're standing in front of your full, open closet -- with negative minutes to spare before you need to be out the door -- completely unsure of what to wear for the day ahead. Now, when I say we've all been there, I mean it, because, according to the new Wardrobe Operating System, FINERY (which just launched Thursday! ), "In their lifetime, women will spend more than eight years shopping and another two years deciding what to wear, yet only wear 20 percent of their wardrobes." That's where Brooklyn Decker, FINERY's Chief Design Officer, and Whitney Casey, FINERY Founder/CEO, come in. They see the problem -- heck, they have it themselves -- and they're determined to solve it. 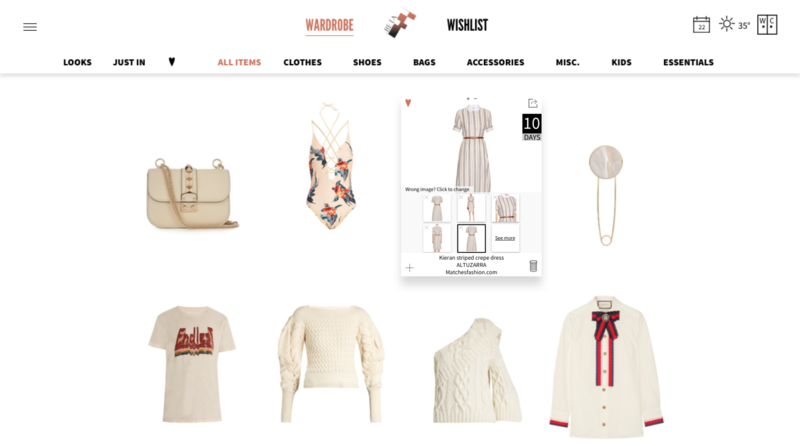 Here's how it all works: You sign up with your email (or several) and the system combs through past digital receipts and order confirmations to create your virtual wardrobe. The system simply uses keywords, such as 'order,' 'confirmation,' or 'shipped' when searching for your items. What about the items you didn't buy online, you ask? If your receipts from those purchases weren't sent to you digitally, you can simply search for items you own online and add them to your virtual wardrobe via a FINERY plugin extension. You can also upload photos of really, really old pieces that may not have a digital footprint -- but Decker and Casey want that to be your absolute "last resort." From there, you can create outfits with your virtual wardrobe anytime, anywhere. Have a big day coming up? Plan your outfit in advance while you're waiting in line for coffee so you're not scrambling the morning of. Genius. What's more is that you can create dream outfits via your virtual "Wishlist." This is where the items you're coveting live -- and you can pair them with items you own to ensure they'll fit right in and be worth the purchase. While the system is not a shopping destination first and foremost, you can make purchases directly from the site (though you don't have to for the system to work its magic). You'll even be notified when one of your "wishlist" items goes on sale. And if you notoriously forget about return deadlines, FINERY has you covered there, too. SCORE. Okay, so, here comes my absolute favorite part: If an item you recently bought goes on sale after you've made your purchase, FINERY will arrange for you to get a refund of the difference as long as it's within an approved window of time. I know, I know, hard to believe! Oh, and one more thing! Don't let the name fool you. The system supports several retailers -- including discount stores, like Target and Wal-Mart. As a matter of fact, Decker and Casey aren't strangers to a deal either. Decker told AOL Lifestyle at the NYC launch event Thursday that her closet is full of pieces from The RealReal, admitting, "I like nice things, but I don't want to pay the nice prices. I love all the secondhand stuff, personally." As for Casey, she depends on Rent the Runway (yes, FINERY supports that, too). "I have stuff in my closet only for a little bit, and then it goes out," she told us. So, how does your closet compare? What are you waiting for? Go and find out!